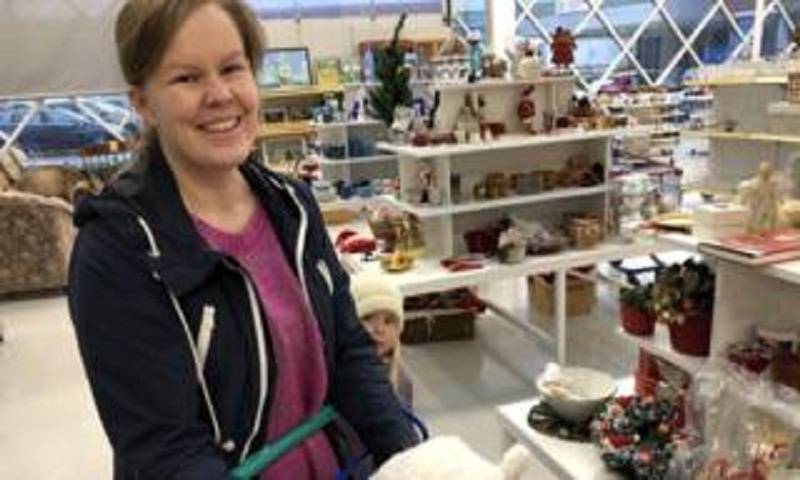 With her daughter and baby son, Kati Rossi is prowling a suburb of Helsinki in the hunt for a second-hand bookshelf. Across the road looms a Swedish furniture giant, but Kati is scouring a huge municipal re-use centre instead. “I don’t want to go to IKEA,” she tells me. "I will find something much more interesting here, and much more original. As concern grows about the resources we’re using and the CO2 that is producing our goods, does this place hold lessons for the world? It is one of a network of giant non-profit re-use stores in Finland. Not the regular sort of second-hand or thrift stores you find on the High Street, but giant supermarkets named Kierrätyskeskus. The centres repair electrical goods, upcycle some items with their own brand label, and they even have a digital personal shopper – a smart app which predicts the items you’ll want based on previous purchases. In the furniture section, two friends on a day off from the office are browsing together. Hannamarie Johansson) tells me: “I’m looking for new clothes for my new job. Pinja Lauria says: “I really like these places. I used to live in Luxembourg where they have second-hand shops – but not like this. And it is so much more than a store. Shop manager Peppi Mattila gives me a tour of the upcycling section of the shop, known as Plan B. It features some stylish classic clothes made from old curtains (they’re not in fashion so they’ll never go out of fashion). There is also a bench made from a snowboard; a table fashioned from a 40km/h traffic sign; and a stylish tray made from a leather-covered box lid faced with black-and-white cartoon comics. This range of highly individual items sells for more than standard “second-hand” prices. An Instagram blogger Tuire Lindstrom – in an outrageous coat bought second-hand – enthuses over the individuality of stuff here. The Kierrätyskeskus store even has an educational mission. Kaisa Karjalainen, the resident environment specialist, shows me to the “learning wardrobe”. Schoolchildren come here to learn how to investigate the quality of clothes. If the makers have invested in sewing neat seams or carefully stiffening a collar, they are also likely to have also used good quality cloth. “Over recent years we have really noticed an increase in throwaway fashion,” she says. Everyone who buys an item from the store gets a little pat on the back on their till receipt, too. It shows how much natural resources you have saved by buying by avoiding the purchase of a new item. I bought two cute glass Christmas decorations, for instance. The receipt thanks me for saving 84 kg in natural resources used in creating the ornaments - oil, sand, dyes, chemicals and more. The store estimates it saved 50 million kg of resources in total last year. I wondered if giant stores like Kierrätyskeskus would run out of stuff to sell as people supply charity stores and trade things on the Internet. Maybe people will even try to consume less? “It would be good if that’s right,” Kaisa says. Round the world are countless systems to collect and re-use items, from street scavenging in poor nations to sophisticated internet trading in rich ones. Australia has an organisation called Reversegarbage. In the US, Ann Arbor is one of many places with a ReUse Center selling a huge variety of reused household and building materials. In the UK, self titled “Re-use Goddess” Cat Fletcher is fomenting a re-use revolution from her base in Brighton. She complains that in the UK there is a postcode lottery on re-using goods. Some local councils encourage people to take items from recycling dumps – but others forbid it, often on grounds of health and safety and liability. “We have got to try much harder on this agenda,” she tells me. Will Gove spark re-use revolution? In north Yorkshire, for instance, Jim Aldridge took a lawnmower to dump at the local tip. Another customer asked him if he could take it. “But,” he said, “The employee at the tip said we would both have to drive off the site to hand the mower over. "If we did it on site it was considered to be trading - which was not allowed. Is this about to change? The UK Environment Secretary Michael Gove will produce a new waste and resources strategy in coming weeks. Will he deliver on these words? Politicians everywhere are under increasing pressure to re-use resources. The pressure group RREUSE has a simple slogan - it is time to put second-hand first.